These photos were posted on one of my chat groups last week, by a gal in a small town north of Victoria. 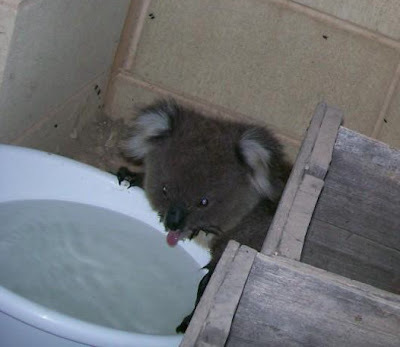 This poor Koala bear sought relief inside a porch and certainly seems to have appreciated the water he was offered. He didn't even mind having a few pictures taken. He decided to stay for a while to escape the extreme 115 degree heatwave. Now Victoria is dealing with far worse than heatwaves. This was a terrible weekend for the people and animals in Southern Australia. Bush fires were fast, destructive and lethal. May relief come quickly. i just read about the terrible fires on some of the aussie girls blogs that i visit...what a tragedy!!! 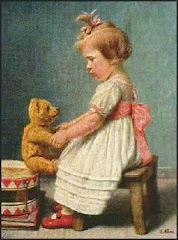 that little bear is adorable:) what a sweet little guy!!! thanks for stopping over to visit with me!!! oh my gosh I know... my friend Natasha has been keeping me posted and it is so devastating. this little guy is SO cute. I love that he is sitting there enjoying the water. I hope relief comes soon. This is very tragic, yes. What a sweet set of photos! Sometime the symbiotic relationship between animals and man never ceases to amaze me. My prayers are with the Australian members of our great human family! Hi Karen, thanks so much for your email and checking in on me hun. No fires on our mountain as yet thank God but devastation further out. My husband is out fighting fires at Toolangi tonight so am mighty worried about that but he is with a good fire fighting team so that helps a lot. We have never experienced anything as bad as this with bushfire before, am lost for words, the loss of life and homes has been devastating. Even those closer into Melbourne city have no idea how bad it is out here. Will try and keep updates on my blog and thanks again for checking in on me! PS. that is an amazing photo with the koala isnt it, that little sweetie must have been VERY hot and bothered as they dont normally even drink water, they get all their moisture from gum leaves! Karen, thank you so much for your thoughts for the people of our country. It is horrendous and beyond belief the amount of lives and homes that have been lost. Our hearts are heavy with grief. The photos of that darling little koala are so cute and it is tragic to think of the wildlife that would have been lost too. He is so cute. I pray that they get some relief from the heat and that the fires are stopped. Thank you for your kind thoughts for Aussies - the death toll from the fires has climbed to 173, about 750 homes lost. The beauty on your blog has been a nice distraction from the unbelievable horror that has happened in Victoria. 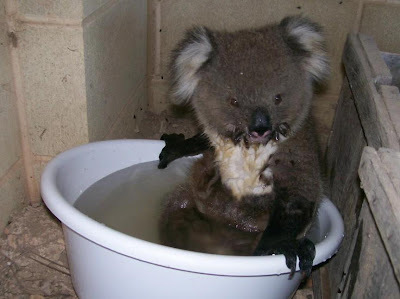 The little koala is so sweet and lovely that he could cool down in the bucket of water. It is just so tragic, the lives that have been lost and entire towns and houses burnt to the ground. I hope that they can have some rain and the fires will be abated. My thoughts are with all those people. What a little sweetheart - Sending love and wishes for the winds to drop to our Australian buddies!